We see these on line in the USA for over $1,000 in USD$ that's like $1,300+ in CND$ plus shipping etc. WITHOUT the real brass fittings. So that makes ours the BUY of the Century.. well okay buy of the month then. Sure ours needs a little TLC to bring it back, but it's ALL there.. Brass claws, brass faucets and stand up shower head.. the works. Winter's coming here's a GREAT project that won't last long at $700.. pitter patter folks. 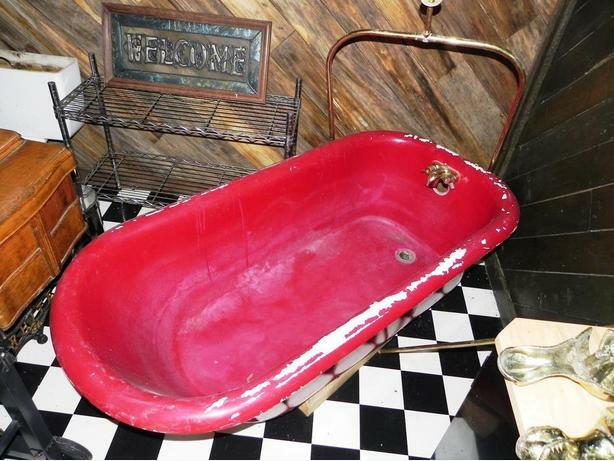 SUGGESTION This tub needs painting, so if you don't like red paint it ANY colour you like to match your taste and decor. Have more questions or want to come out and see it then... Please call owners land line phone direct at 250-597-1218 for more information. If no answer please leave a message and we will get back to you ASAP. Sorry we do NOT do texting or emails. We do NOT do any digital at all, a good friend posted these ads for us. We are strictly old school, ole folks and only do phone calls, remember them!